North Kensington has always had musical connections. From the Welsh and the Irish to the West Indians and the Hippies. All kinds of music found a home here. So it is no surprise there were a lot of record shops. Especially in Portobello Road where some premises were record shops for over 20 years. Let’s start at 202 Kensington Park Road. Rough Trade, 202 Kensington Park Road. 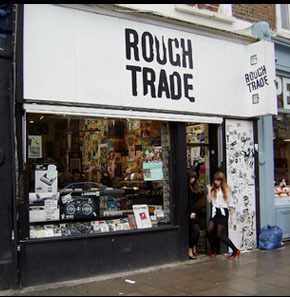 This was the original Rough Trade shop, founded in 1976 by Geoff Travis who conceived it as a record shop equivalent of San Francisco’s City Lights bookshop. The shop was supposed to be in Willesden, but it became apparent that it would be a bit off the beaten track with not a lot of footfall. So his father helped him find this shop, which previously had been a Hippie ‘head’ and print shop. Rough Trade was synonymous with the DIY Punk ethic and everything that went with it like Xeroxed fanzines. 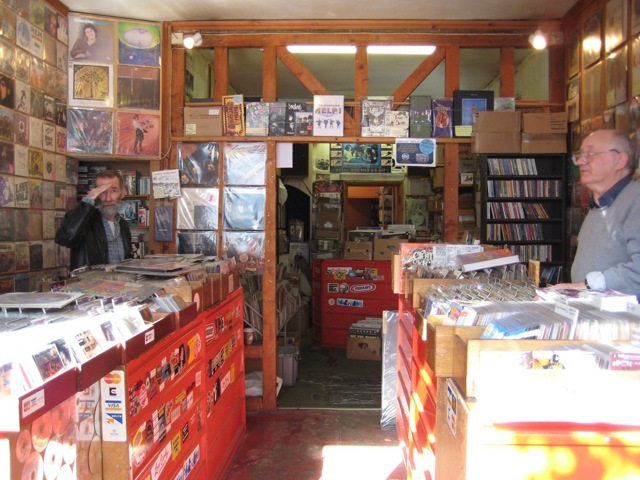 Record shops are often one person’s idea, the result of someone having a vision for a shop and thinking – no-one else is selling the music I like or I can do better or I love/know the music. I have the connections to get the records or just have a surplus of records. Rough Trade belongs to this classic template for record shops. It was very influential as it inspired a whole new generation of shops and ones carrying the range of music Rough Trade pioneered. Though best known for Punk, in fact Rough Trade had a wide ranging, comprehensive, eclectic and cutting edge selection of music, including the latest Jamaican records. The African selection came from a bloke called Jumbo who lived down Oxford Gardens. He had his own label Earthworks and distributed current African music straight from Paris. The music from the African Francophone countries had been virtually unobtainable in this country because the African music here was music was from our colonies – Nigeria and Ghana. Looking to get the latest from West Africa? You had to go to either grocery shops in South London or Sterns at the rear of a radio repair shop in Tottenham Court Road. Rough Trade was also a great social centre, one of those collisions of people coming together. You bumped into all kind of people there. Upstairs is where some of the staff lived. I got a feral kitten called Smiler from there. That block of Kensington Park Road was totally different in the 1970s. There was a wall of corrugated iron sheets opposite where houses had been demolished. The Family Dog shop, Blenheim Crescent, 1969. Photo RBK&C. Local Studies. This is one of our landmark shops. It had been The Family Dog Shop, the first Hippie head shop in England. It closed in 1984 and two Bills – Bill Forsythe and Bill Anderson, a pair of record dealers who previously had operated by Mail Order opened up a shop there called Plastic Passion. They sold all kind of rarities, Bootlegs to 60’s Psychedelic rock, obscure US garage bands to Blues and R&B and collectors items. However, in 1990 the two Bills fell out and split the shop down the middle. Bill F to the left, Bill A to the right, and renamed it Minus Zero and Stand Out. They were still selling the music you were hard pushed to find anywhere else. In 2010 they finally closed the shop. Bill Forsythe still sells records on a Saturday in Portobello at the Red Lion Arcade. The building also had historical significance – upstairs was the offices for various parts of the alternative press including Frendz and the Whole Earth Catalogue. Also it was the haunt of local poet/playwright and the Frestonia character Heathcote Williams. Frestonia was the hippie breakaway state based round Freston Road inspired by the film Passport To Pimlico. Lets go over Portobello to the current Rough Trade Shop at 130 Talbot Road. Vinyl is big business again, the successful record shops these days are the ones actually selling records. Vinyl, things you can hold and smell, the pungent odour of the solvent evaporating from the printing or the sharp tang of fresh pressed vinyl. And you can read the sleeve notes without using a magnifying glass. The shops selling old records have a distinctive smell of old dust as well. In 1982 there was a split in Rough Trade between the label, distribution wings and the shop. The shop workers went independent and bought the shop out. Now there are three Rough Trade shops – Talbot Road, Brick Lane and one in Brooklyn. They have managed to keep the open minded ethos of Rough Trade in their shops. Pete Donne, one of the original trio who bought the shop, now runs the Brick Lane shop, and went to Brooklyn to set that up shop to run the right way. I still buy from Rough Trade. You want that pre Pol Pot Cambodian Psychedelic rock? It’s there. We head west past by All Saints Church and left into Powis Gardens. All Saints Church Hall (now demolished) was the venue for early psychedelia – the Pink Floyd played there. Over into All Saints Road, to what used to be called the Frontline. Which was a centre for the black community based around the Mangrove Restaurant but also was the most policed street in Europe at one time. This is People’s Sounds record shop and has been here since the 1980’s run by very old hipster Daddy Vego, one of the Windrush generation. North Ken as a West Indian area always featured quite a few record shops, but now People’s Sounds is the only Reggae shop left. The other main Reggae shop was Dub Vendor, at first a hole in the wall under the railway bridge on Ladbroke Grove, and then a shop on the corner of Cambridge Gardens. But they closed down in 2008, with a change to digital in the Jamaican music and the Congestion Charge was the nail in the coffin for them. If you look above the door to People’s Sounds they have a heavy duty waterproof electrical socket to power their Sound System at Carnival. They are surviving, they sell records online and in the summer have tourists in the know coming to buy. They have a really comprehensive selection of music of interest to Jamaicans (and others). Vinyl was crucial in the Reggae world and is still revered and held in high regards by the purists. 7 inch pre’s or pre releases were the standard musical form in Jamaica – LP’s were a luxury. The 7 inch was also the currency for the Sound Systems wanting the latest tune to rock the crowd. The fresh 7’s were airfreighted into England weekly. By Thursday they were in the shops. Friday the serious buyers came out, pockets full of wages. You stood there in a tight crush, when someone completed their shopping and moved out, everybody shuffled forward. You attracted the attention of the person behind the counter with a sign that you wanted that record. It could be a nod or finger pointed or a eyebrow twitched and that record joined your pile on the counter. Walking down St Luke’s Mews and into Basing Street, past the Basing Street Studios where so much great music was recorded and left into Lancaster Road and then left into Portobello. In the early 80’s this was a record shop called Sounds, a popular black music shop selling soul/funk/jazz. Stocking whatever the local passing trade wanted. But it went the way of many local record shops and succumbed to the prevailing wind of internet retailers, bootlegging and downloads. In the 70’s it had been an adjunct of the Family Dog shop. Historically it was an interesting shop. In the 60’s it was called Etcetera. An early vintage clothing shop that could possibly have predated ‘I was Lord Kitchener’s Valet’. Etcetera was run by Anne Valery. Anne was an ex Rank Starlet, she was in Kind Hearts and Coronets and got swept over the weir with the first of the Alec Guinness characters. But she is best known for her TV screenwriting Angels and Tenko. She told me she used to go to France to get WW1 German Leather Coats. Musicland was an important chain of shops. In the 70’s, it was renowned for the imports stocked. Local musician and freak Mick Farren talked about a bloke who worked there called Simon who hipped him to the first MC5 album. Musicland was where you could find the latest US releases like Frank Zappa, Velvet Underground and the West Coast psychedelic releases (Simon Stable later had his own record store at 297 Portobello). Musicland was a big player in the independent record shop world. They had a number of shops through out London, including their West End shop in Berwick St where a chap called Reg Dwight later to be Elton John worked. Musicland was owned by Windrush generation immigrants the Ali Family and Lee Gophal. Lee had started with a stall on Portobello selling the latest Jamaican records. In 1968 he sold out his stake in Musicland to create Trojan Records along with Chris Blackwell. Lee was also Blackwells landlord in Neasden Lane where Lee had a label called B&C. Later 230 became a shop called Music Scene an amalgam of Musicland and Scene and Heard. This had been an Indian textile shop called Hindukush till 1988 when Vinyl Solution took over. Vinyl Solution started as a record shop in Hereford Road W2, buying and selling secondhand records, but moved into the new electro music. They had a record label based at the shop. 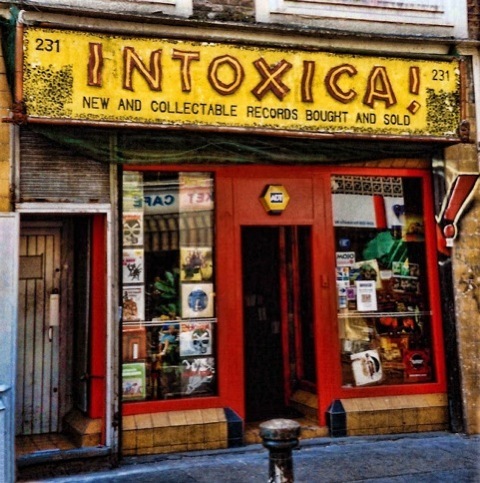 In 1995 it became Intoxica, which was decorated in Hawaiian Tiki Style, in quite deliberately bad taste. It sold secondhand and collector records, it had an easy listening rack, original, pristine Bert Kampherts, not exactly cheap but a bargain compared to the £600 rare records on the wall. It sold every kind of obscure music, from soundtracks to surf music. 245 Portobello Road has an illustrious history. In 1974 it was bought by the Ali family to be turned into a Musicland shop. According to Jim Ali (S.W Ali’s son) it actually became Jolly Jester run by him and his brother in law Ken Weston. Then became the Klik Reggae label and shop run b y an ex Trojan staffer Joe Sinclair. You could find dj/artists like Tappa Zukki and Dillinger hanging out outside when they were signed to the label. It then became Bargain Records run by Jim and Tom Skinner. 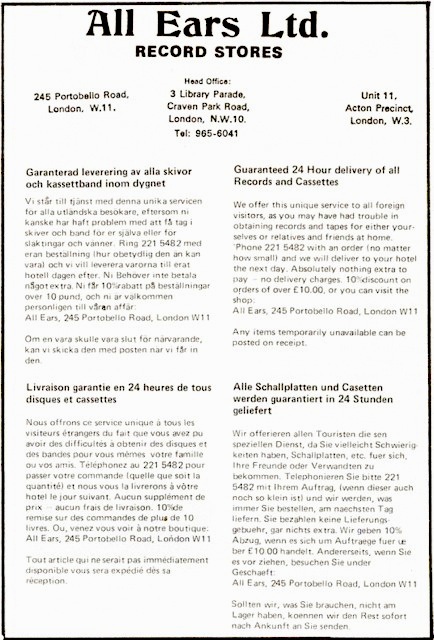 It changed its name to All Ears run by Larry Sevitt, if you were an overseas visitor you could ring up All Ears with an order and they would deliver to your hotel. It returned to Bargain records, then Knockout Records both run by Ken Weston and Tom Skinner and then Westside Records run by Jim Ali and the aptly named John The Record. It returned to Bargain Records before becoming Bargain Music and finally closing in 1992. On the corner of Lancaster Road in the 70’s, local Boom Baby author Brian Nevill had a stall in the basement selling Bootlegs and stuff. During the 80’s and 90’s it was Culture Shack, run by Danny and Derek. It had stalls selling records, and a barbershop. Further up past the Westway is 297 Portobello another important address with a long lineage of record shops. In the 60’s it was Melody Records selling Jamaican music, then it was part of Lee Ghopals’ Musik City chain. Also here was Simons Stable, Shakedown, Young Blood and Johnny Dickens Oldies Shop. It ended it’s musical life as the Jamaica Sounds label and shop. This one block between Oxford and Cambridge Gardens has major historical significance. There were seminal clothes shops like I was Lord Kitchener’s Valet and Forbidden Fruit. Designer Barney Bubbles (Hawkwind) and the Back Ah Yard Caribbean restaurant plus the Black People’s Information Centre. Also it was a hotbed of the alternative press like International Times and Frendz. Honest Jon’s, 278 Portobello Road. Honest Jon’s is an institution and has been at 278 Portobello for 32 years. It started originally by Jon Clare in an arcade at 93 Golborne Rd selling 50’s jump jive, Blues and Jazz. 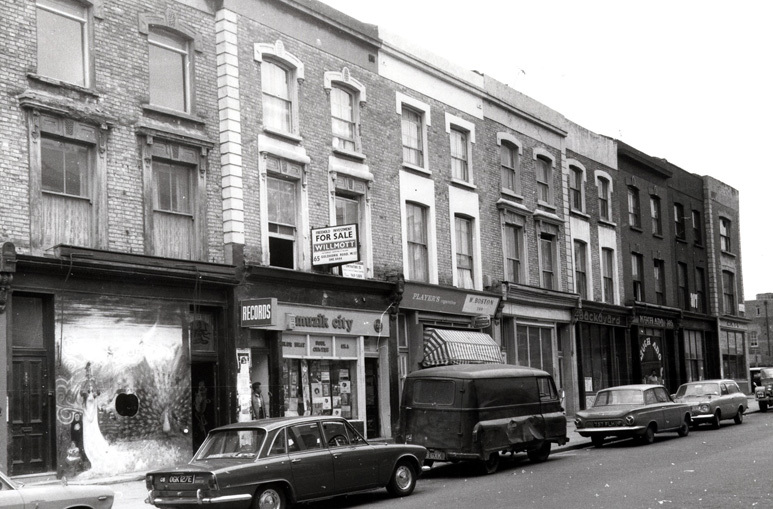 Then in 1974 moved over the road to 76 Golborne Rd. He briefly moved to Camden before returning to the area in 1982. They sell a vast range of music. You want the latest Ethiopian re-release or Jazz, Reggae or Soul? They have it. They also stock the latest dj must have 12”s. In the 80/90s Honest Jon’s had a record label called Bopicity which put out contemporary music from London jazz bands like drummer Tommy Chase. Now they have a new label Honest Jon’s Records which has access to the vast EMI catalogue and has delved into Calypso with the London Is The Place For Me series, along side vintage West African. But they also put out left field, oddball releases and anything that takes their fancy. Honest Jon was a dapper Jazz and Be-bop fan who was also a therapist and psychotherapist, which some of us would suggest are good skills to have in dealing with record shop customers. Jon retired to paint and write in Wales. Long term staffers Mark and Alan bought it out and now run Honest Jon’s. The genie is most certainly out of the bottle for record shops and we can never go back to the old days and the way record shops were. But there are some vinyl oasis’s in the desert of downloads. And they are continuing to serve up what people need and want. Just look at the queues outside Rough Trade on record shop day. This entry was posted in Shops, Streets, Uncategorized and tagged All Saints Road, Backayard, Blenheim Crescent, Family Dog Shop, Honest Jon's, Intoxica, Kensington Park Road, Muzik City, Peoples Sounds, Plastic Passion, Portobello Road, Record shops, Rough Trade. Bookmark the permalink. This is a wonderful article.It took me right back to the ’60s when I first came to live here and discovered the area and the richness of life. I am still hooked ! The shop was Harpers, I worked there from approx. 1960, when I was 12 years old, until I was approx. 18 years old. It was also an Electrical shop, as well as selling Children’s toys, it was in fact 2 shops, one side selling Electrical goods, on the other, Records & Toys. Thank you for your update on Harpers. Dear Derek, The only record shop on the right hand side coming up from Chesterton toward the Railway bridge was called Harpers Record Centre at 87. Whether it sold electrical goods I have no idea (before my time) But many shops did sell records and electrical goods. The other notable shops were just below Harpers and based in a arcade – Rock On and the early Honest Jons’. Most of the other record shops were on the other side of the road. I will be doing a Golborne specific round up next. Thanks for information on record shop called harpers.what if any is your connection to w10andw11. I went to school at Oxford gardens 1952 to 1958.then we moved to Roehampton. I have been living in sutton since 1973.best years of my life living in w10. Derek, I have lived and worked in W11/W10 for 45 years. I used to work at the Electric Cinema in Portobello Rd in the 1970’s. 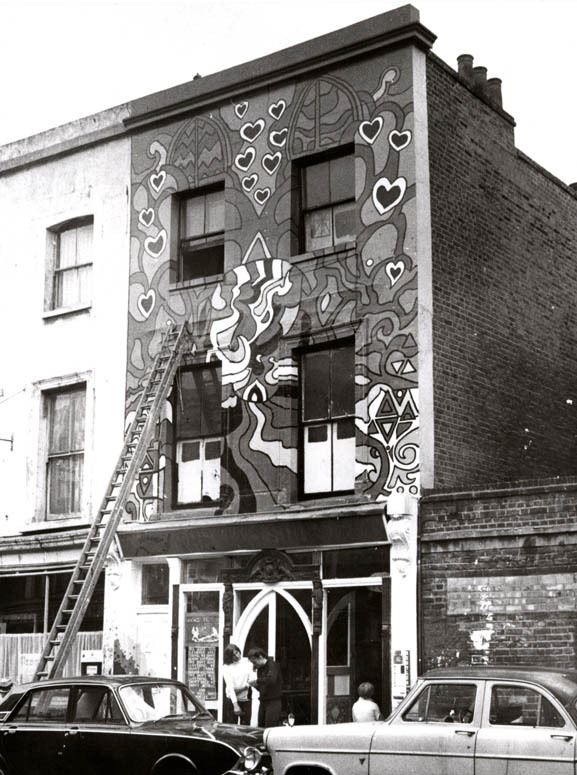 London’s first head shop, The Head Shop in Kensington Park Rd (1966) preceded The Family Dog Shop in Blenheim Cres. Was involved with both. Great times. I have the shop that preceeded Rough Trade named as Badge Boutique. 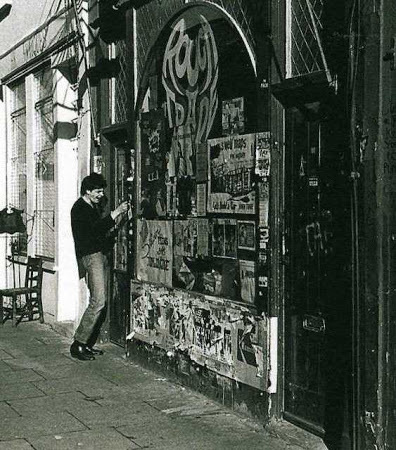 Not sure Dave which shop preceded the Talbot Rd Rough Trade shop. Some way back I think it was Bill the Dairy’s? Wonder if Mike Lesser (Ken Pk Rd Head Shop) could have been involved in the Badge Boutique, as one of his family business’s produced badges)? Great RBK&C photo of the Family Dog Shop artwork on Blenheim Cres. Before that incarnation, it had briefly gone under the title, The Institute of Psychedelic Research (another headshop). Jane I am talking about the 202 Ken Park Rd Rough Trade. There was a Dairy/shop next door to that Rough Trade. And also next door to the Talbot Rd shop, which became a magazine called Zig Zag. Mike Lesser? I will have to see what can be dug up. Yes I have seen the Dog Shop photo’s there is a couple of different ones from different periods I assume. Institute of Psychedelic Research I like that! I did not arrive in Portobello till 1971 so the early days I have no personal knowledge of. On what i have heard and understood. I used to work at the Electric Cinema during the 70’s. Hi Derek Ford,the record shop asked about in Golborne Road was named Harpers. It was two shops in one, one half sold records and electrical goods,the other half sold cycles. I went to school at St.Clement Danes, in Du Cane Road. I lived in Barlby Road. I bought my first record there in 1950 and my first bike there in 1949. 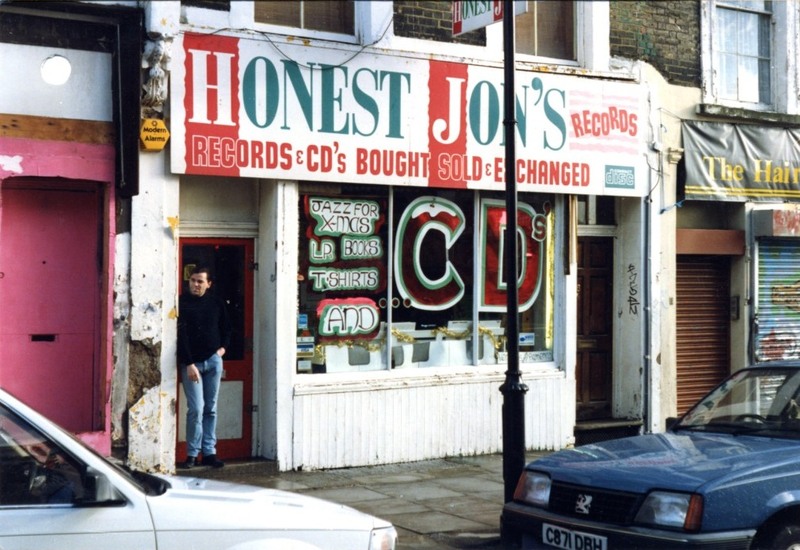 Great shot of Honest Jons taken must be circa 1986, when I lived above it. That’s my good friend who ran it in the doorway. CDs big news back then! Hello Rob, you mean Laurie in the door at HJ’s?. All the people who have lived above the shop – that is almost a story in’s own right! Yes, that’s Laurie, having a crafty fag. I lived there with him and Nick (and others) from 84 til 87. Did you live there too? Yr name is familiar! No, Rob I was just a regular customer. I was a DJ. I used to live at 49 Chesterton Road. We moved from there in 1948 we lived in the ground floor. I used to live in Balfour House, St. CharIes Square, I remember Rock On which was in Goldbourne Road on the right hand side coming up from Portobello Road, run by a guy named Ted Carroll, he knew his music and was a pleasure to chat with him on saturday afternoons, he sold a lot of demo records, London American (orange) & Atlantic(yellow) I bought a lot back then, boy they must be worth a few bob now, Ted is now a director at Ace Records, check out their website and you will find a photo of Ted behind that famous counter, great memories. Dear Pete, I am in the process of writing the history of the Golborne Rd Record shops and will add that when it is finished. Honest Jon had a stall in Ted Carrols ‘arcade’ befroe he set up on his own over the road. There were not a huge amount of record shops in Golborne but the ones that were, are all very important ones. Don’t forget Harpers at 87 Golborne rd. I worked in there from age 12 until was about 20, full time and part time spanning from 1960-68, it was a record/toy shop on one side, the other shop at 85 was an electrical shop. The manager was a man by the name of Les Kelly, he was a lovely man, the owners name as I remember was named Mr. Day. No Lee I am not going to forget Harpers. I like the sound of your record shop history. Will it cover Portobello or just Golbourne Rd? I have some pics of Honest Jons circa 83/84/85 and in touch with past employees. Hello Rob, I have covered the Portobello Shops in this blog. I have discovered another shop that i did not know about which was a Calypso shop in Blenheim Cres opposite Plastic Passion. I am also friends with quite a few ex staffers at HJ’s. I do a walk and talk tour round where the shops were, and the ones still left, plus the new additions The Vinyl Cafe and the Dub Vendor pop up shop at the Mau Mau bar. I do not really mention the various record stalls that are under the Westway as they are not permanent. I am always interested in new pics of HJ’s. I always intended Golborne to be a different story to the Portobello one as it does deserve it’s own history. Hi Dave, how should I send you the pix I have? Is it the email on the About page? Or I can tweet them if you’re on twitter? northkenstories@yahoo.co.uk just send it there please Rob. Yes, Rob the main email.